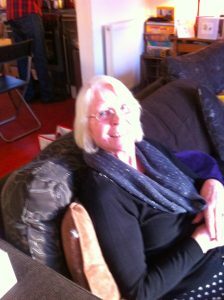 Here’s my mum, Margery. I’ll be giving her flowers, Philomena on DVD (which she loved at the cinema) and we’ll go to Dawyck Gardens for tea and cakes. As for me, I’ve been banging on about, ‘Oh, I hope I get this or that’ for Mother’s Day. But it’s occurred to me that it’s not really about presents. It’s more about what the day doesn’t involve, than the acquisition of chocolate or perfume or any manner of lovely gifts (although naturally, anything my adult-sized children should choose to give me will be snatched, greedily, in amazed delight). No, when I think about what Mother’s Day should entail, I keep coming back to: as little as possible. Unsurprisingly, a recent survey revealed that, after a trip out with the family, what women want most is a day free of cooking and chores. I know – it hardly reeks of glamour and thrills. But it’s true: I really don’t want to be expected to peel a potato on Sunday. Or sluice out the kitchen bin, or have anything to do with the big stinky pipe at the back of the loo. Nor do I want anyone to ask, ‘Do we have any butter?’ Normally, I’d say, ‘I think so – look in the fridge’ (just in case I might have cunningly hidden it in the bathroom cabinet). But on Mother’s day, should the butter question should arise, I shall feign deafness or, more likely, reply, ‘I have no idea.’ And I’ll look baffled as if unsure of what butter actually is. By the way, I don’t want my family to take the no treats thing too literally. I mean, I won’t shout, ‘Take it away!’ if something home-made and delicious were to be placed before me, with a glass of chilled wine. And if they decide to, you know, take me out for lunch or something, then of course I’ll be pleased to go. Just, you know, in case anyone’s wondering.